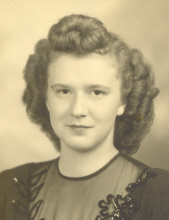 Margaret Virginia Flory Erbaugh, 91, of Bridgewater, passed away Tuesday April 9, 2019 at the Bridgewater Home. She was born in Dayton, Virginia on March 24, 1928, and was a daughter of the late Walter and Emma (Landis) Flory. Margaret was a lifelong member of the Dayton Church of the Brethren where she served as Deacon and was active in the Women’s Circle. Margaret was a devoted wife and mother for her family. She was united in marriage to Eugene Irvin Erbaugh on August 3, 1947, who preceded her in death on January 2, 2015. She is survived by her three sons, Larry G Erbaugh and wife Joyce of Harrisonburg, Donald A Erbaugh and wife Sherri of New Market, and Douglas W Erbaugh and wife Gail of West Point. She is also survived by a sister Elizabeth Kinzie and husband William, sister in law Lucille Brunk Flory, ten grandchildren and five great grandchildren. She was preceded in death by brothers Raymond and wife Doris Finks Flory and J Carson Flory, brothers in law and sisters J Weldon and Catherine Flory Wampler, Hubert and Evelyn Flory Showalter, and sister Ruth Flory Rhodes. Margaret was employed for many years by Drs. Fluharty and Broderson Dental Offices in Dayton, Virginia. A memorial service will be held at 11:00 am on Saturday April 13, 2019 at Dayton Church of the Brethren. Burial will be private. The family will receive friends on Friday April 12, 2019 from 6:00 pm to 8:00 pm at Dayton Church of the Brethren Fellowship Hall. In lieu of flowers, memorial contributions may be made to Dayton Church of the Brethren, 202 Main St., Dayton, VA 22821. On line condolences may be sent to the family at www.johnsonfs.com. To send flowers or a remembrance gift to the family of Margaret Virginia (Flory) Erbaugh, please visit our Tribute Store. "Email Address" would like to share the life celebration of Margaret Virginia (Flory) Erbaugh. Click on the "link" to go to share a favorite memory or leave a condolence message for the family.